A grilled cheese sandwich. One of the most perfect foods to eat, especially if we’re talking about a grilled cheese done in the form of an Italian panino. 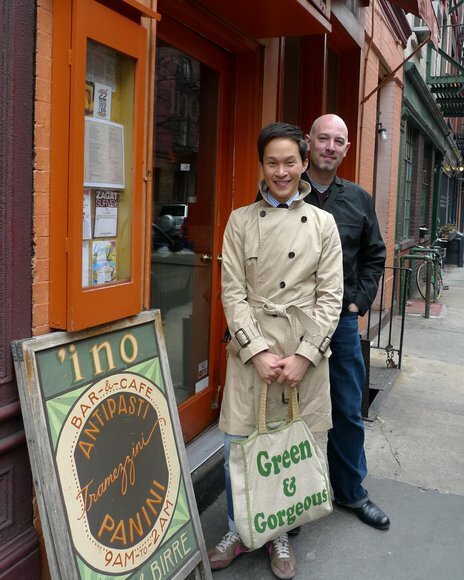 (Plural: panini) Last August I wrote about this little Italian panini shop and wine bar in Greenwich Village called ‘ino. Opened by Jason and Jennifer Denton, protégées of Mario Batali, this is the cutest place and, though I didn’t know it beforehand, kind of a ‘big deal” in the New York Italian restaurant scene. 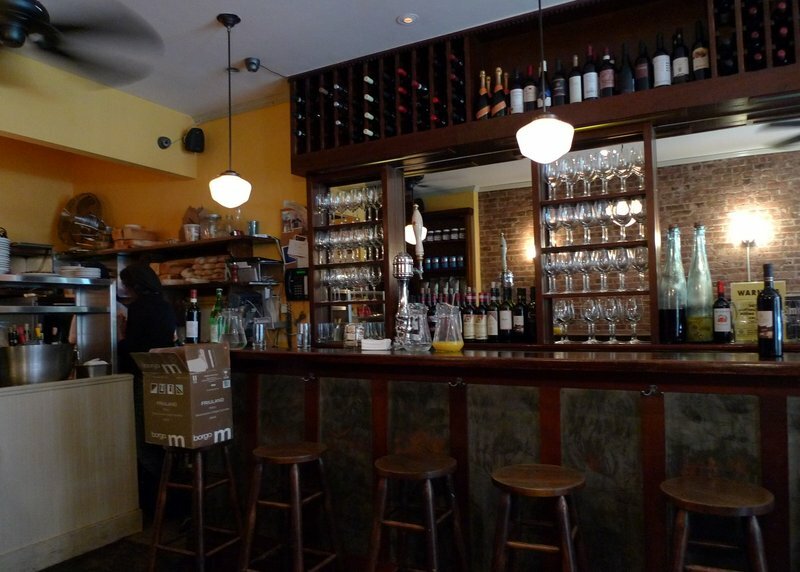 The place is tiny – perhaps ten two-seater tables plus a half-dozen stools at the wine bar. With a brick wall on one side and a bar on the other, it is cozy and welcoming, a place that you just want to stop by on your way home to have a drink, snack on a few tasty bites of something, and catch up on the neighborhood gossip. It is what I think a “third place” should look like. The kitchen is thirty square feet, no larger than enough room for two people, two panini grills, and a toaster oven. It is enough to make me stop complaining about my kitchen and instead think about adding some more shelves. Tawn’s school friend Rosrin and her husband Sean recently moved to Manhattan from Boston, and had their first child, Quinn. Being equally big foodies as Tawn and me, we met Rosrin (along with her father and her son) for an early lunch one morning. Back at home, we regularly make panini as a weeknight dinner. Cut from a fresh loaf of homemade whole grain bread, two grilled slices with some meat, cheese, and something tangy inside make for a healthy and wholesome meal. Serve it up with a side of mixed greens and it transforms the ordinary sandwich into something really special. 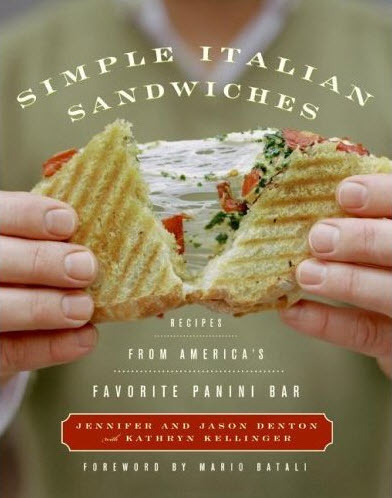 While eating, I discovered that ‘ino sells their cookbook, Simple Italian Sandwiches: Recipes from America’s Favorite Panini Bar. Needless to say, I now have a copy. Now, why do I need a recipe book for something that is, at its most basic, a grilled cheese sandwich? Because I realize that my panini, while satisfying, are pretty plain. I’m not getting the most out of them. The panini I eat at ‘ino have another level of flavor complexity that elevates them to a whole other plane of existence. 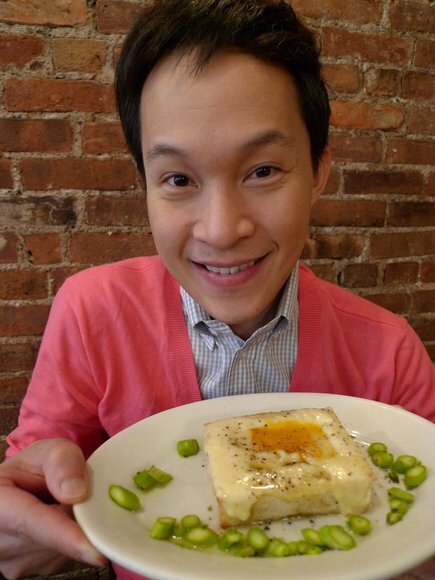 For Tawn, there was one objective in mind, besides visiting with Rosrin: to have a slice of ‘ino’s truffled egg toast. This thick-cut white bread is toasted, hollowed out, filled with egg yolks, and topped with fontina cheese. After a few minutes of broiling, a healthy dash of truffle oil is poured on top and some sautéed asparagus is served alongside. Available morning, noon, and night, the egg toast is the highlight of the menu. Now that I have the cookbook, I’ve discovered the not-so-secret secret to making their egg toast. When I tried this at home after our last trip, I put a whole egg into the middle of the toast, which was too much egg and overflowed. Now I realize that the trick is to use two yolks and no whites. I’ve also learned about several spreads and sauces I can make to help spice up my panini at home: roasted peppers, olive tapenade, an balsamic roasted garlic, to name a few. Watch for some future entries resulting from the purchase of this cookbook. 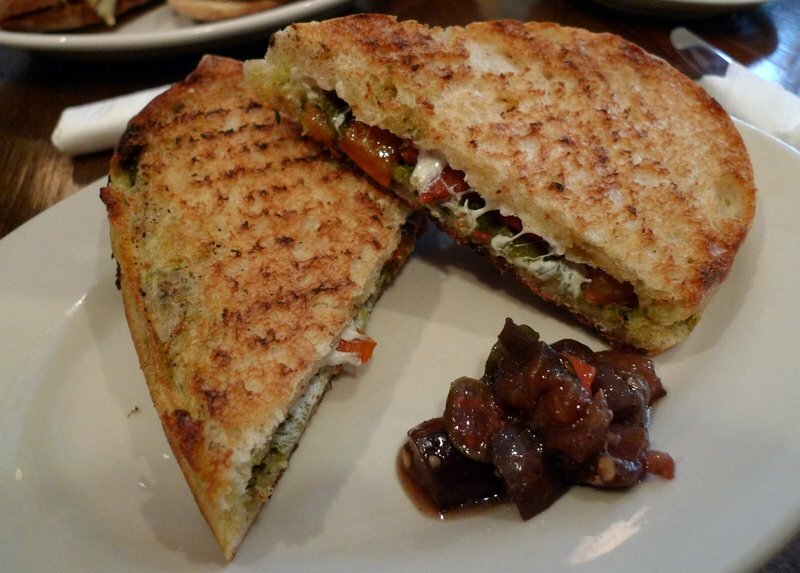 Above: Panino with pepperonata (roasted bell peppers), fresh mozzarella cheese, and basil pesto. The panini are really exquisite at ‘ino. Another lesson I learned is that instead of cutting slices from a loaf of bread, they use ciabatta rolls with the top sliced off. This ensures that every bite has some crust from the bottom side. I’ve tried doing this but so far my homemade ciabatta have so many large bubbles that fillings form the panini spill through the bread. I’ll have to keep practicing and see if I can create (and then consistently reproduce) a ciabatta that compares to the ones made at the Blue Ribbon Bakery, the next door bread supplier for ‘ino. Above: Scrambled egg, cheese, and sweet onions. How’s that for a breakfast treat? We returned for breakfast the day before we left, one last chance to enjoy one of the most fun little restaurants we’ve been to, a gem that we would love to recreate here in Krungthep. Could you imagine this somewhere along Soi Thong Lor? Not with people dressed like this, I think. This entry was posted in Uncategorized and tagged Dining, food, ino, New York City, Panini, Sandwich by christao408. Bookmark the permalink. Ha! You ALWAYS tend to make me hungry!Here, have some good old yank food for a change! The restaurant seems very cozy indeed. You do have a taste for panini! I’ll certainly bookmark this restaurant for my next visit to Manhattan. Another wonderful post! You should open a Panini shop!! =) I wonder how those would fare in Asia. I’ve been thinking of getting a panini grill because I love grilled sandwiches (grilled breakfast wraps are so good too! ), but haven’t figured out which grill is the best yet. I’ve done it again – ventured into here without eating first! Rumble Tums again LolI’m puzzled by that Panini. I’ve had it over here twice and it didn’t look anything like that above. It’s quite a while since I had them but from what I remember, the ones I had were long and you got 2 served with salad – more of a ‘meal’ than a snack. Next time I go out for lunch I shall order Panini and compare the difference ! Chris, I have to hand it to you. Your blog has this really nice folksy, travelogue, friendly charm that is also informative and insightful. I love the pics. Speaking of 3rd places, there’s a few coffee shops that have communal tables now and I think there’s a restaurant in my ‘hood that also has the ssme thing. I haven’t seen that term Third Place before. It kinda reminds me of Xanga – and if I can reach into your blog for food, then your blog definitely qualifies! They look so yummy! I wish I could have them for lunch. I like the undercover agents look of your last picture. Probably not a welcoming sort of look for a restaurant. Brooklyn2028 could try freezing his bread, making sure to wrap it well, perhaps in individual pieces or just enough for one meal. Not quite as good as just out of the oven, but much better than stale. Can’t keep it in the freezer too long, but it would get him through a week or so. Ah! I knew it! 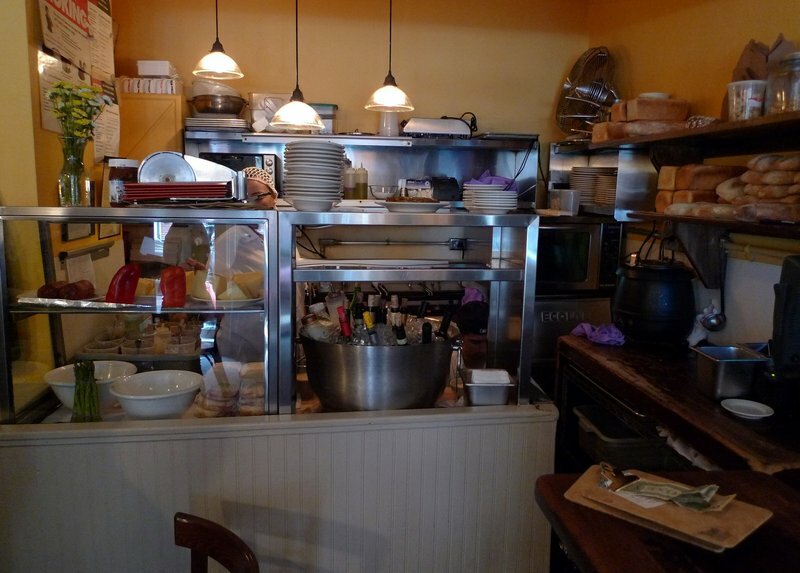 You will be opening a cozy spot not far from home for the serving of delicious panini. I know you want to … besides you already have the name and logo (see blog title! )I think I know what’s on the menu for tomorrow! @murisopsis – There’s four loaves of no-knead ciabatta sitting under the air conditioner in the bedroom, with a little less water than last time to see if they’ll spread less. Last night I cooked balsamic roasted sweet onions, roasted garlic, and pickled onions as condiments. Yes, you know what’s for dinner tonight! And as for the shop, if I could get a bread recipe consistent, I would seriously consider it. @brooklyn2028 – That brie, lime juice, and pea shoot combination sounds great. I imagine some arugula would work nicely, too. My mom suggests that you can slice your bread, wrap it very well, and put it in the freezer. It will last for a week or so and if you’re grilling the bread, it is okay if it has dried out just a touch. Other option is to buy a ciabatta roll, slice off the top to level it a bit, then slice it parallel to the cutting board to make two halves. @jandsschultz – Well, we smile when we walk in the door. @And_I_love – Are sandwiches yank food? Wasn’t it a British invention? @foggysunnymorning – They would be a perfect lunch. And breakfast. And dinner. =D@Wangium – Don’t cry, Jason… =)@lil_squirrel4ever – That’s the dilemma I’m facing, too. We have a cheap convertable grill that can make those sealed rectangular sandwiches, serve as a grill, or make waffles. It works okay but is a little small and lacks the heft to smoosh the sandwiches. The authors of the book suggest that the retail model by Krups is a pretty good quality panini press for the money. @ElusiveWords – I would be more than happy to share the food with you Matt, anytime. Just come on over! The “third place” concept is something I’ve been reading about and interested in for years and it is one reason that I briefly studied urban planning in school. I would have continued on that path but ended up changing schools and the one I transferred to didn’t offer that major. I agree that in some ways Xanga does serve as that third place. @Chatamanda – Fair warning to you to eat before blogging! =D Yes, some panini are made from sliced loaves of bread and I think are a bit larger. These actually were meal-sized but not huge. If you split one with another person, it would be a decent snack. @agmhkg – The question is, will you be near a panini shop for Sunday brunch? @stevew918 – If we were to open a restaurant, this would be it. That or a breakfast place with my buttermilk biscuits. @brooklyn2028 – I have the same issue as well. It’s tricky buying fresh bread for one person. I sometimes end up having it for breakfast & dinner (and lunch if I’m working from home) so that it doesn’t get too dry. Hot sandwiches always seem better to me than cold! Chris, are the egg yolks that go on the bread, whipped up? any seasoning added to them? I would like to try that. This looks wonderful. @ZSA_MD – I think they are scrambled with salt and pepper, served with sweet onions that have been slow roasted in balsamic vinegar and olive oil, and some fontina cheese. 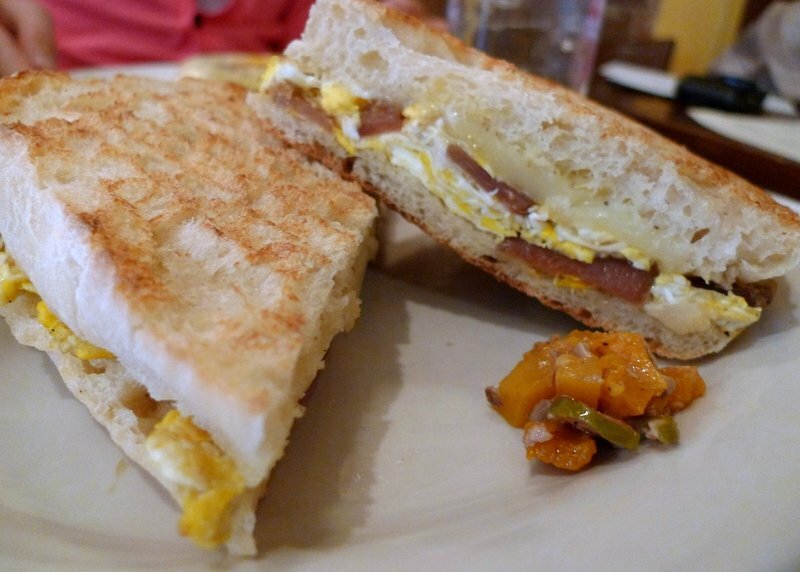 @TheCheshireGrins – I think the crunchy exterior adds more to the sandwich than a soft exterior. The Italians have perfected the sandwich. Subway destroyed it. 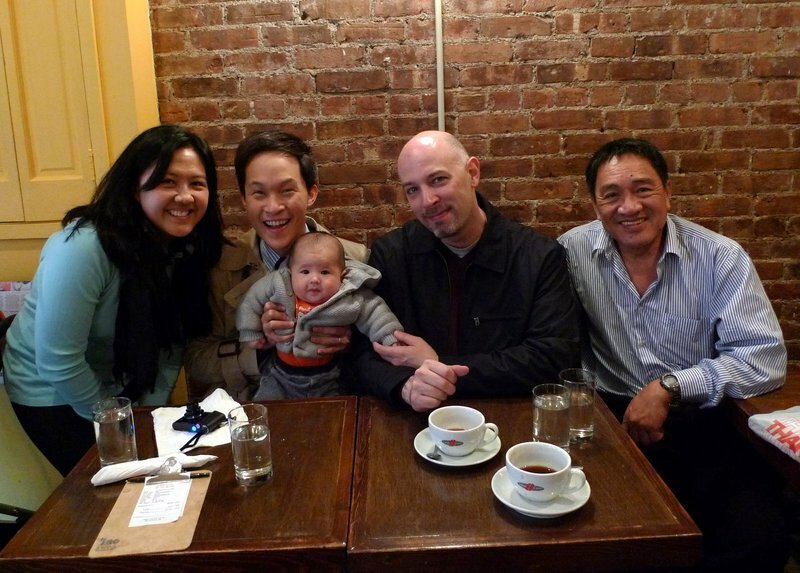 @yang1815 – Next time you are in NY you have to go there. @christao408 – I will. Reservation is not required I assume? @christao408 – Figured as much.